TeacherStar Update: We’ll send a Videographer to Your School! The Common Core State Standards for writing have raised expectations of what students should be able to accomplish in the elementary grades, and research has demonstrated that in order for writing instruction to be truly effective, certain elements must be present. IESD (Interactive Educational Systems Design Inc.), a leading research organization for education, has published a new white paper, “Elementary Writing Programs: How They Match the Research and the Common Core,” examining how six leading elementary writing programs measure up to the requirements of the Common Core standards and research-based best practices. Include consideration of grammar, usage, and mechanics instruction; writing strategies; Writer’s Workshop model; process writing approach; 6 Traits/6+1 Traits Model; concise daily lesson plans; web-based resources; multimedia resources for interactive whiteboards; and formative assessment. How did WriteSteps measure up to the analysis from IESD in comparison to other elementary writing programs? WriteSteps was the only writing program to fully meet the criteria for 16 categories in IESD’s evaluation. 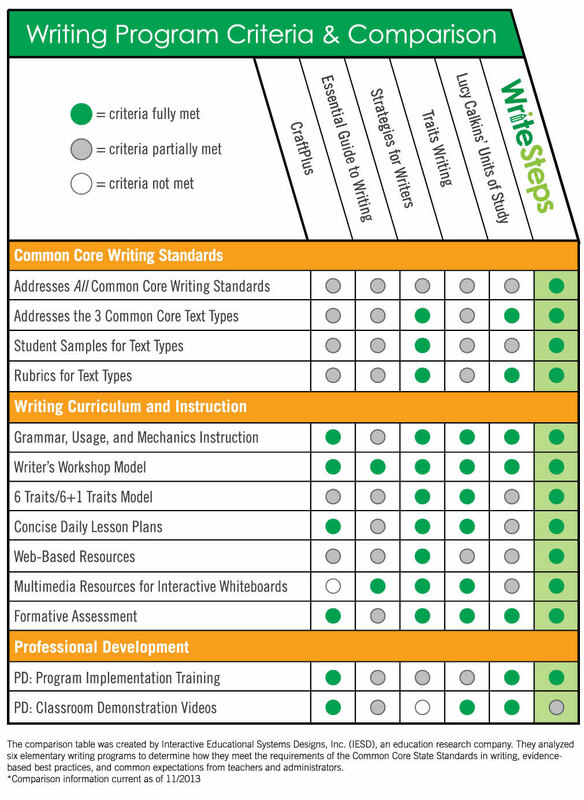 In the “Common Core Writing Standards and Related Instructional Features” section, WriteSteps was the only program that fully addressed all 10 Common Core writing standards. Strategies for Writers, Units of Study, and WriteSteps were the only programs that fully addressed all three Common Core text types (argument writing, informative/explanatory writing and narratives). WriteSteps and Essential Guide to Writing were the only two programs that fully addressed the Common Core requirements for gathering, assessing and integrating information. In the “Other Aspects of Writing Curriculum” section, WriteSteps and Strategies for Writers were the only two programs that fully met the criteria for all the evaluation categories. Strategies for Writers, Traits Writing, and WriteSteps were the only programs to fully employ a 6 traits/6+1 traits model. For an easy, at-a-glance review of the top-level evaluation results, here is a table summarizing the sections, categories and how well each program met the evaluation criteria. TeacherStar™ Update: We’ll Send a Videographer to Your School! We know from experience that modeling is a powerful tool. We are seeking TeacherStars to model WriteSteps lessons for our nation’s teachers. This is an opportunity for you to make an impact outside of your classroom. We would like to send a professional videographer to film you teaching a complete WriteSteps lesson, at no cost to you! If your video is included on eWriteSteps, you will receive $200.00. Are you ready to take the next step and share your WriteSteps lessons with the nation? Contact our TeacherStar coordinator, Emily, at [email protected] or 800-689-1408 #15. 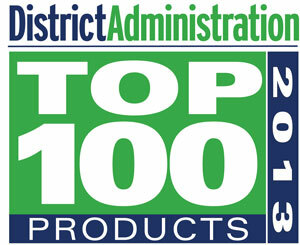 We’re honored to have been chosen as a product for District Adminstration’s Readers’ Choice Top 100 Products Award in 2013. Winners were chosen from over 1,800 nominations that were sent by K12 leaders detailing the products’ positive impact on their schools. The award’s purpose is to inform superintendents and other school district leaders about products their colleagues around the country are using to help their districts excel. A huge thank you goes out to all of you who took the time to nominate us, and who have supported WriteSteps over the years! It’s our goal to provide the top elementary writing program on the market that helps students succeed in writing, and we couldn’t do it without your help! Coming to a Conference Near You! Kim and Terry Gates, together at the Staff Development for Educators Conference in Las Vegas, NV. Kim and Terry Gates are escaping the Michigan winter to attend the Florida Educational Technology Conference. Come by booth #1457 to learn how WriteSteps empowers teachers to prepare students for Common Core testing and a lifetime of confident writing! Right after Orlando, Kim and Terry will be traveling to sunny San Diego for the National Title 1 Conference. Stop by and say hello to the dynamic duo at booth #100! 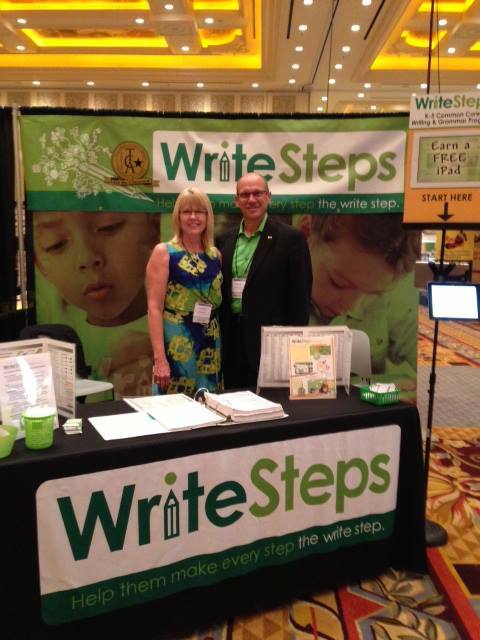 Join us at the Colorado Association of School Executives-Winter Conference at the Westin Hotel in Westminister, CO. Find out how WriteSteps will help your students improve their writing skills by providing teachers with day-by-day lesson plans that help make teaching writing easier! If you live in Colorado, you have two chances to learn more about WriteSteps! Visit us in Denver during the Colorado Council International Reading Association Conference at the Rocky Mountain Event Center, Marriot DTC Hotel. While there, you can sign up for a free trial to eWriteSteps, which automatically enters you into a drawing to win a new iPad! Marilyn Massey, Awareness Ambassador, will be at the Georgia Council of Teachers of English, located at the Mountain Creek Inn at Callaway Gardens. WriteSteps has been approved by the Georgia State Board of Education for inclusion on their ELA State Recommended list for use in Georgia classrooms for the next six years. This is the perfect opportunity to learn more about us. Terry Gates, our National Awareness Director, will be attending the Wisconsin State Reading Association Conference in Milwaukee, WI. Reading and writing go hand in hand, and he’s looking forward to sharing WriteSteps with all of you! WriteSteps is heading to the Big Apple this year to present and exhibit at the New York City Elementary School Association’s Conference located at the Brooklyn Marriot. Find out how WriteSteps will help your students improve their writing skills by providing teachers with day-by-day lesson plans that help make teaching writing easier! Copyright © 2014 WritingCity, All rights reserved.